The Corporate Governance Code is a collection of recommendations on good corporate governance for listed companies. The recommendations of the Corporate Governance Code supplement the obligations set forth in the legislation. The objective of the Corporate Governance Code is to maintain and promote the high quality and international comparability of corporate governance practices applied by Finnish listed companies. Good corporate governance supports the value creation of Finnish listed companies and their attractiveness as investment objects. The purpose of the Corporate Governance Code is to harmonise the procedures of listed companies and to promote openness with regard to corporate governance and remuneration. From the perspective of a shareholder and an investor, the Corporate Governance Code increases the transparency of corporate governance and the ability of shareholders and investors to evaluate the practices applied by individual companies. The Corporate Governance Code also provides investors with an overview of the kinds of corporate governance practices that are acceptable for Finnish listed companies. The Corporate Governance Code is applicable to all companies that are listed on Nasdaq Helsinki Ltd1 (Helsinki Stock Exchange). According to the Rules of the Helsinki Stock Exchange, all issuers of shares that are traded on the official list must comply with the Corporate Governance Code. However, issuers of securities other than shares, as well as companies whose shares are listed, for example, on the First North Helsinki marketplace, do not have the obligation to comply with the Corporate Governance Code. Pursuant to the Securities Market Act, issuers of other securities traded on a regulated market, such as issuers of bonds, shall include a Corporate Governance Statement in the report by the board of directors or in a separate report. These and the companies traded on the First North Helsinki marketplace may, of course, choose to voluntarily apply the Corporate Governance Code, either in full or in part. The Market Practice Board is responsible for interpreting and providing further guidance on the application of the Corporate Governance Code and its recommendations. 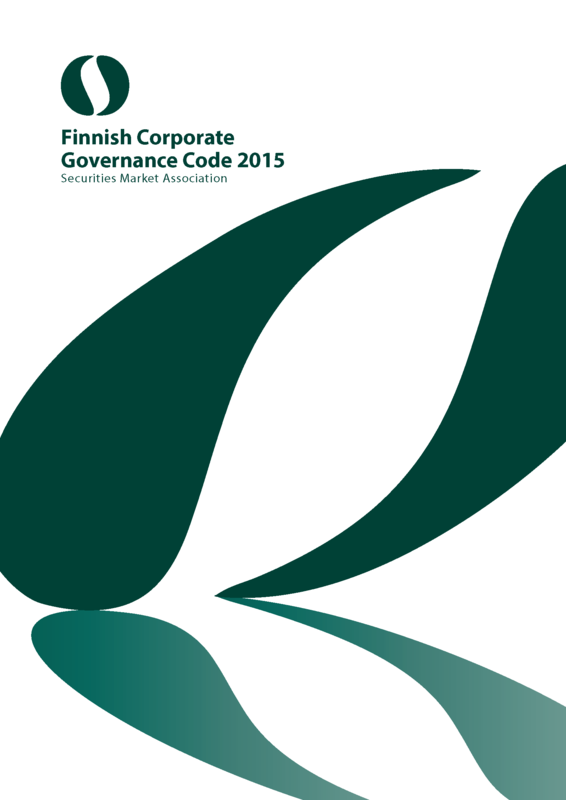 A print copy of the Corporate Governace Code is also available and can be requested from info(at)cgfinland.fi.